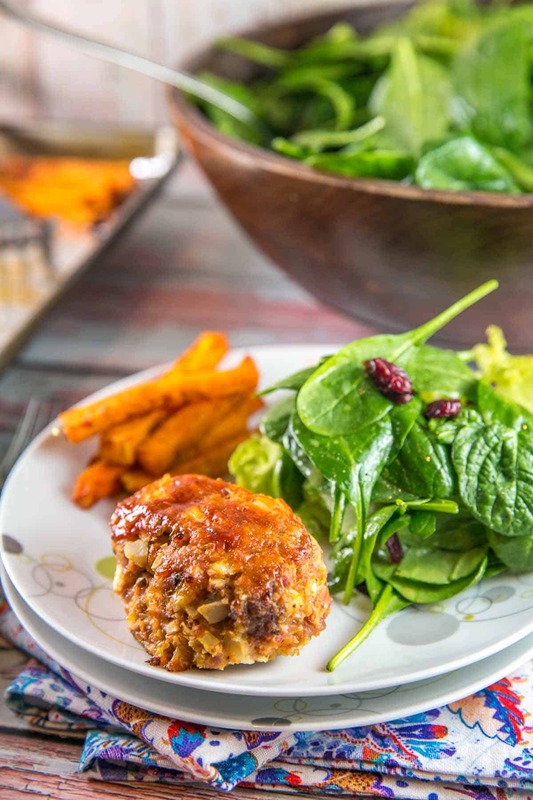 Mini meatloaves cook are on the table in just 30 minutes – the perfect weeknight dinner! A childhood comfort food, upgraded with a little extra zing, and cooked on one sheet pan for easy cleanup or make ahead meal prep. 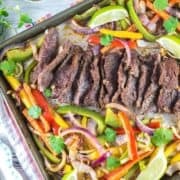 I’ve been singing the praises of sheet pan dinners far and wide lately, and you guys are on board! I keep getting more emails and questions about them, and about weeknight dinners in general. If you’re struggling with getting dinner at the table on a reasonable hour, I get you. I get you so much. I often don’t get home from dinner until 7pm or later, and I have a 3 year old. We try to eat dinner together every evening. You see the struggle here. Sheet pan dinners are key in making this work. You can prep everything ahead of time and leave them on the sheet pan in the refrigerator. 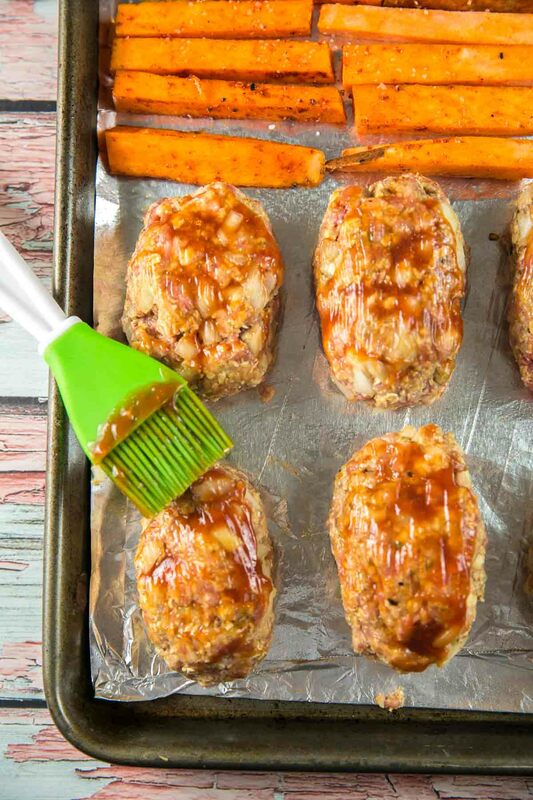 When you get home from work (or the playground, or wherever), just pop the whole sheet pan in the oven. Done. I can’t even begin to process how chaotic things will be when I go back to work in a few weeks now that we have a second child. In preparation, I’m trying to perfect as many sheet pan dinners as possible to make weeknights go as smoothly as possible. These sheet pan mini meatloaves have become a favorite around here. Why mini meatloaves? They cook so much faster than one large meatloaf. Plus, what 3 year old doesn’t love to get his own individual food item on his plate, rather than having to cut and (gasp!) share?! The mini meatloaves come together really quickly, if you don’t have your act together enough to prep ahead of time. Because they’re hand-formed, rather than cooked in a loaf pan, you don’t have to worry about anything sticking to the loaf. It’s easy to tell if they’re done by cutting one open, if you can’t find your meat thermometer. Basically: foolproof. I like to use a 50/50 mix of ground beef and ground pork in these, because ground beef is always just a little too dry for my own personal preferences. Don’t eat pork? No problem! These work just as well with all beef, or even ground chicken. Most meatloaf recipes call for bread crumbs; I use almond flour (or sometimes even ground oats – toss some whole oats in the food processor first!) instead. I love that the almond flour/almond meal adds a little extra protein, cuts down on the refined carbohydrates, and makes this an easy gluten free options (don’t forget to check the labels on your condiments, though!). 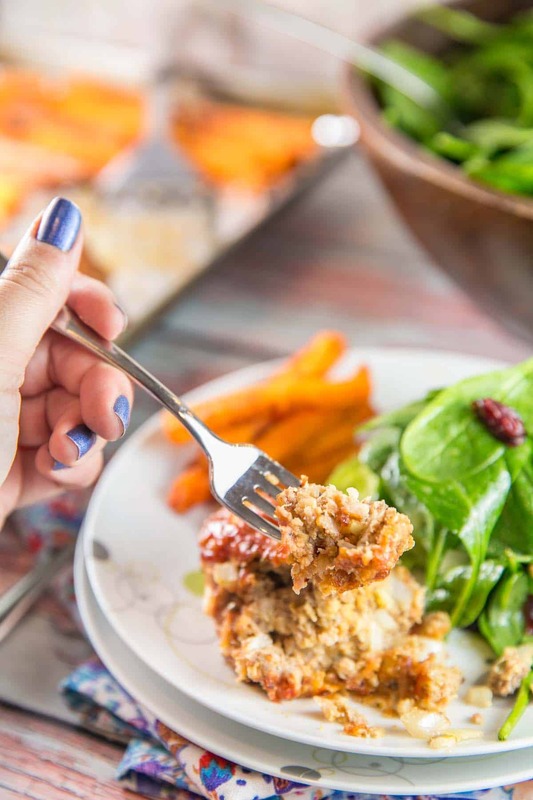 We always make ours with baked sweet potato “fries.” The sweet potatoes bake for the same amount of time as the mini meatloaves, which makes everything really easy. Pop your sheet pan in the oven and walk away. Come back, and dinner is ready! While the meatloaves rest for a few minutes, throw together a big green salad. Hands off, weeknight dinner at its finest. So tell me: are you as into sheet pan dinners as we are? What are your favorites? I’m always looking for new recipes to try, especially before I head back to work! Love sheet pan dinners? 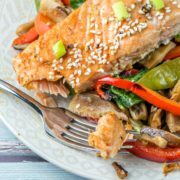 Don’t miss these recipes! 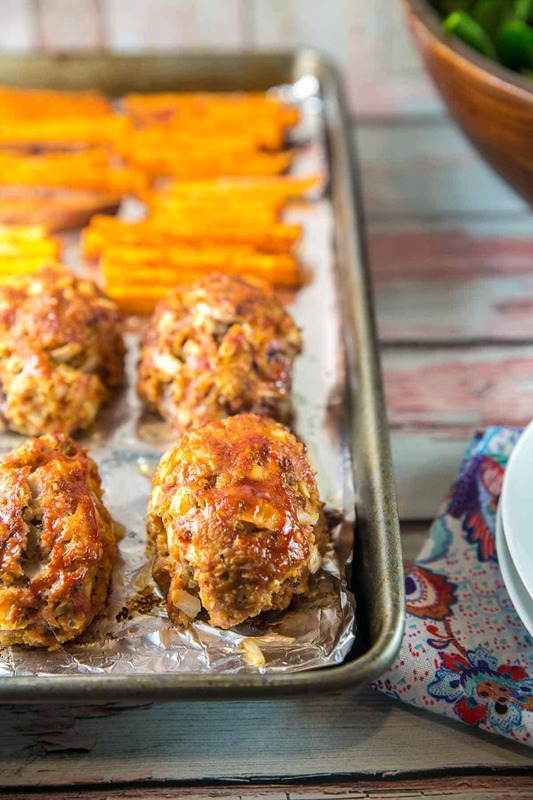 Mini meatloaves cook are on the table in just 30 minutes – the perfect weeknight dinner! Preheat oven to 400 °F. Line a half sheet pan (18 x 13 inches) with aluminum foil and lightly spray with nonstick cooking spray. In a large bowl, combine all the meatloaf ingredients, except for 2 tablespoons of the ketchup. Mix together well, using your hands, until all ingredients are combined. Form meatloaf mixture into 8 evenly sized loaves. Place the mini meatloaves side by side on the sheet pan. Brush remaining ketchup on top of the meatloaves. In a second large bowl, combine all the sweet potato fry ingredients, tossing well until all sweet potato sticks are coated with the spice mixture. Place the sweet potatoes in a single layer on the other half of the sheet pan. Bake in the oven for 20-25 minutes, or until the meatloaves reach an internal temperature of 160 °F. Remove from the oven and allow the meatloaves to rest for 5 minutes before serving. 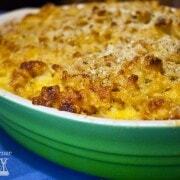 What a great weeknight meal! I am a huge fan of sheet pans, and meatloaf, and sweet potato fries! 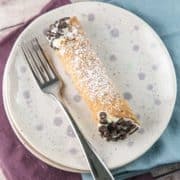 So.. basically I love this recipe! This is going into my meal rotation! 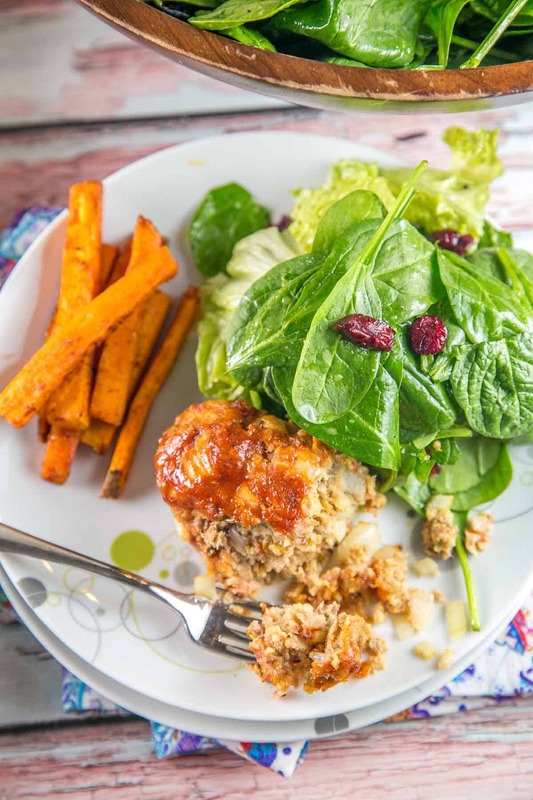 Meat loaf and sweet potato fries in one pan, plus being gluten free makes it perfect. Yum!! I love meatloaf and this is such a cool idea for making individual servings. I love that you didn’t use a muffin tin because they are always such a pain to clean when you are done. Can’t wait to give this a try! YES – those muffin tins are impossible to clean out. Agree completely! Love this new take on meatloaf! And I love the ease of sheet pan dinners too. Less mess=awesome! These look really good! 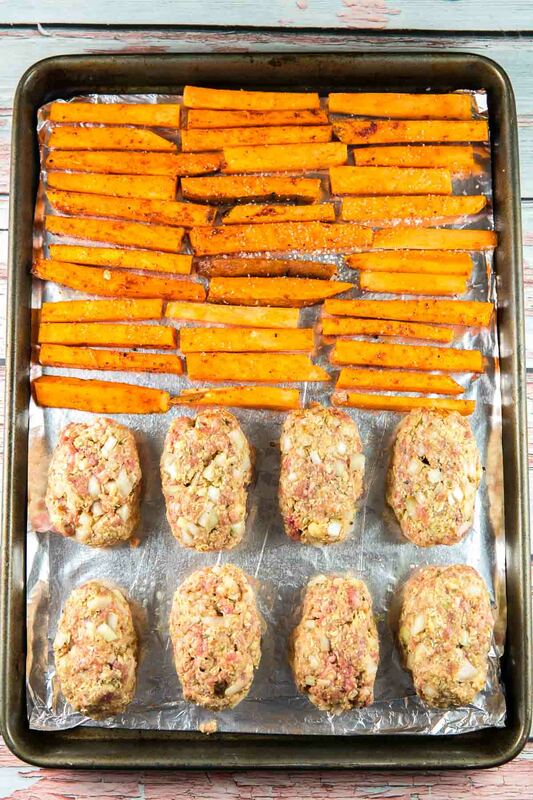 I make my own version of sheet pan mini meatloaves, but I didn’t pair them with sweet potatoes. I’m going to have to give that a try next time! A great idea for busy nights! I like the combination of beef and pork to soften the texture. We’re about to introduce another baby to the mix so I could use more easy sheet pan dinners! These meatloaf are so cute and look delicious! I love that they are mini, that makes it so easy to portion control!! Great idea!! This is just brilliant! 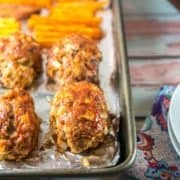 I absolutely love how much faster these mini meatloaves are, compared to making a typical, large meatloaf that might take 45 minutes or an hour. Who has that kind of time on busy weeknights?!? 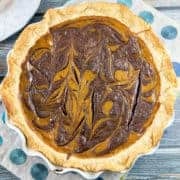 Even better – those gorgeous sweet potato fries are a perfect side dish and just bake right along on the very same pan – perfect! And like you said – what kiddo could resist their own, personal little serving? Adorable! 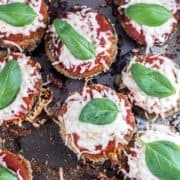 This is such a great idea, and they look so tasty good! Can’t wait to give them a try! LOVE the individual serving size! Not everyone in our household is a meatloaf fan (hard to believe, I know) so this would be a great option for something I could make ahead and then serve with another entree to appease both sides. Can’t wait to try this! This is genius!! I have only ever made a meatloaf in a loaf pan. I have got to try this!